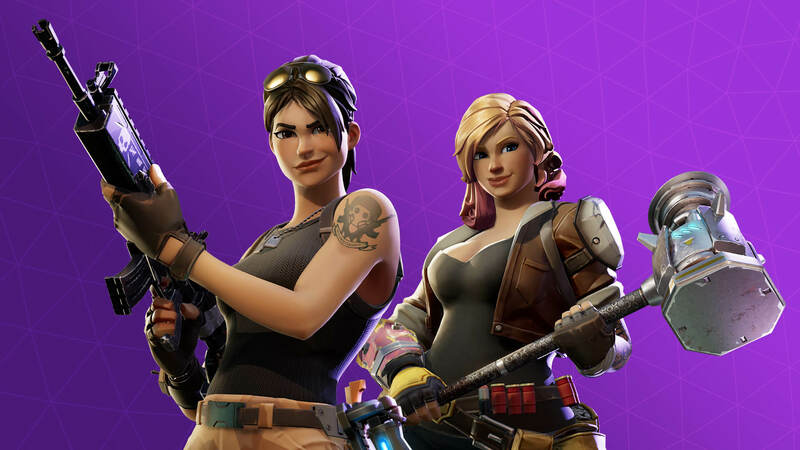 Since Fortnite: Save the World’s launch, we have envisioned a way for players to take steps to customize their items to suit their playstyle. It’s here and we can’t wait to share it with you! In patch v4.2, we’re introducing a way for you to choose and upgrade the perk loadout for your favorite weapons and traps! 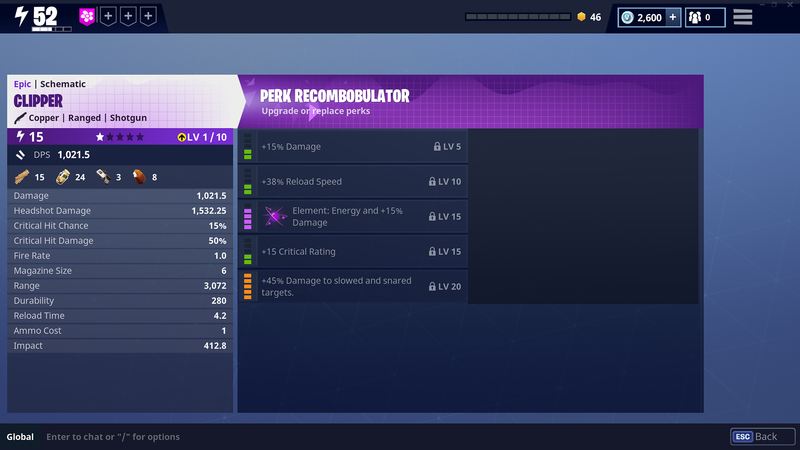 The Perk Recombobulator is unlocked when you complete Plankerton Storm Shield Defense 2. At that point, a sequence of two side-quests will become available that, upon completion, reward you with a large number of brand new resources to use in the Perk Recombobulator. Be sure to complete these quests to get a head-start with your item customization! To access the Perk Recombobulator, visit the item upgrade screen, and navigate to the new ‘Modify Perks’ option. Replacing or Upgrading perks costs two new resources: RE-PERK! and PERK-UP!, respectively. RE-PERK! is available throughout all mission difficulty levels from Low Threat Plankerton missions and beyond. PERK-UP! begins appearing at the same time as RE-PERK, but also has different rarity levels; the rarer versions become available as players progress through higher and higher mission difficulties. These will appear in mission rewards, mission alert rewards, repeatable quests, and the event store for the duration of the Blockbuster Event. In addition, you’ll be able to choose which element you want on your weapon. This modification requires elemental resources named FIRE-UP!, AMP-UP!, and FROST-UP! You can find these resources in mission alert rewards and repeatable quests. 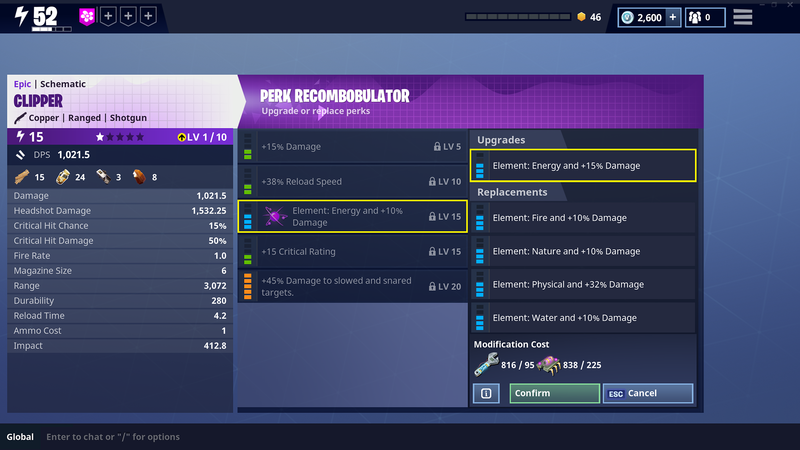 The Perk Recombobulator is a big change from the previously existing perk system. It allows players to acquire more powerful perks than ever before, replace perks that they don’t want with ones that are more desirable, and invest in those perks over time to develop the perfect item. With these benefits come one big restriction: each perk slot on an item is limited in which perks it can actually contain. Newly acquired items are automatically set up to adhere to these new restrictions and players can begin upgrading and replacing perks on them immediately. However, Legacy items (items acquired before Patch 4.2) do not automatically fit into the new structure. Such items must be converted before they’re allowed to be upgraded and respecced via the Perk Recombobulator. When players attempt to modify the perks of a Legacy Item, they will first be prompted to opt-into converting the Legacy item into the new system. Before opting to convert the item, the system presents you with a before-and-after preview of any changes that may occur to the item. In some cases, there will be no change, and in others the perk loadout may be altered. Sometimes, a ‘Free’ slot may appear. Free slots allow players to choose what goes into that slot for free after the conversion is accepted. In all cases, the Conversion process is free, and on a per-item basis. This means that each Legacy item must be converted to work with the Perk Recombobulator, one-at-a-time. Once the process is performed on an item, you’re free to begin customizing that item’s perks! 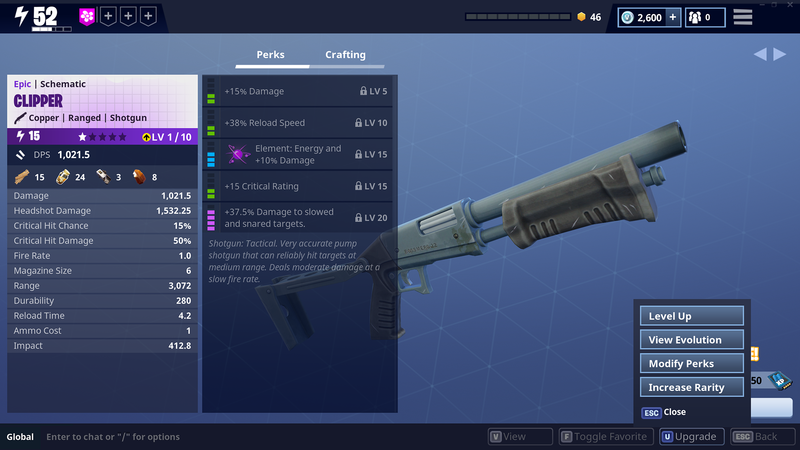 Elemental items now have a dedicated perk slot that determines what type of elemental damage that weapon deals, rather than adding elemental damage on top of affliction damage, snares, or other effects. Each perk now has five levels of power, up from three. Players can now upgrade individual perks to reach these higher power levels. This means that if you want your Legacy item to reach its full potential, you’ll want to convert it to work with the Perk Recombobulator! Each perk slot has a range of possible perk types that it can contain. Players can choose to replace a perk in a given slot, but the list of perks that a slot can be changed to is limited in scope, and varies from slot to slot. Some perks cannot be changed at all! The Perk Recombobulator is our next step towards creating a thriving item economy where YOU decide how to best create the items you want. We’re looking forward to hearing your feedback on this feature as we adjust and tune it going into the future. Thank you, and happy Recombobulating!